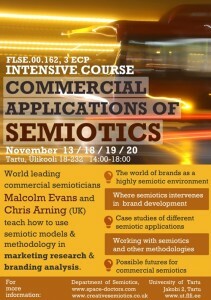 Intensive course “Commercial applications of semiotics” by well known commercial semioticians Malcolm Evans and Chris Arning. November 13.-20., 2014. University of Tartu, Department of Semiotics. 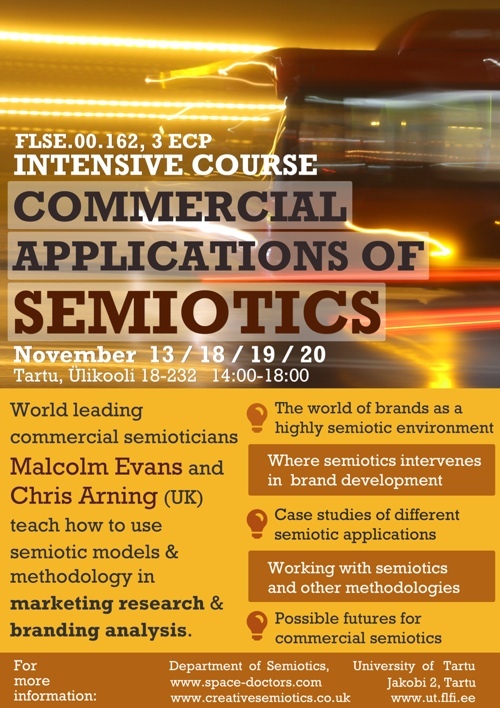 Everybody is welcome to join an intensive course where world leading commercial semioticians Malcolm Evans and Chris Arning will introduce how to use semiotics models in marketing research and apply semiotics methodology in the field of branding analysis. Former advanced knowledge about semiotic concepts is not required and students from all departments are very welcome. The course is opened for registration in SIS, it is called “FLSE.00.162 Applied Semiotics and Professional Practice”, students can achieve 3ECTS by passing it. All courses will take place in the main building of the university (Ülikooli 18), in room 232.